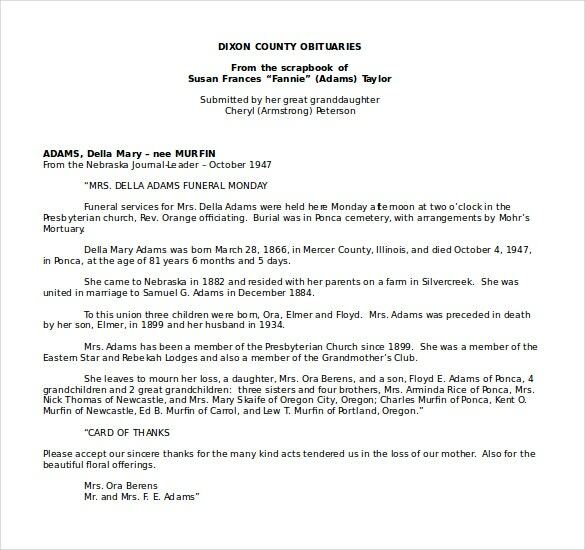 When composing an obituary, it is important that all details are mentioned. Even if certain arrangements are being left out or undone, it is a good idea to include text indicating the same so that attendees are not caught unawares. 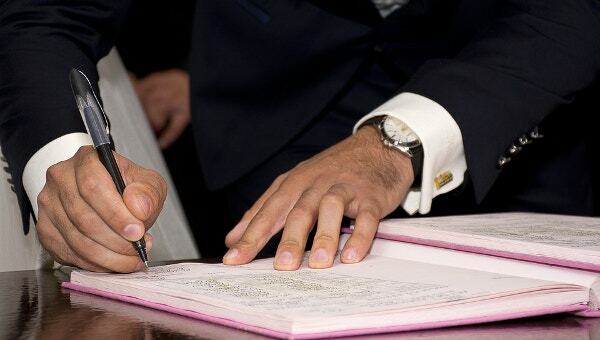 In the templates there is additional space provided in case you need to list out information of activities which are not going to happen in the course of the funeral. You can see also newspaper obituary templates. We can understand your situation and are so courteous to bring to your notice the lifesaver funeral program templates for the Word which are intended to ease your work with heart touching lines and themes. Even the content is so soothing and suitable either for a burial or a cremation. We are equally conscious and aware of the intensity of the tragedy as well. Hence, we are so cautious about the crafting of the words. You can see also Death obituary templates. You need not dig out the emotions and phrase it up. 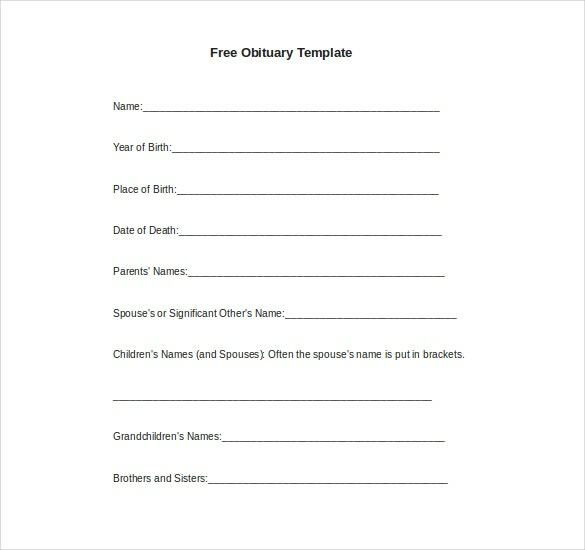 Try our free obituary templates online. Just download MS Word documents. That’s it. You are done. 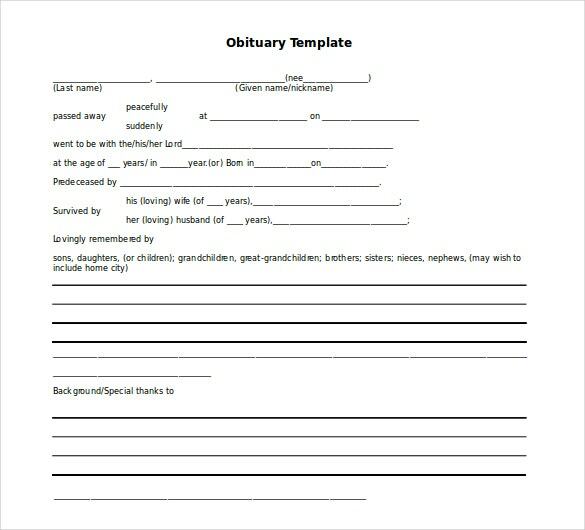 Fill in the blank obituary template is ready. If at all you want to share your stories and/or add any memories to the eulogy, add them up. 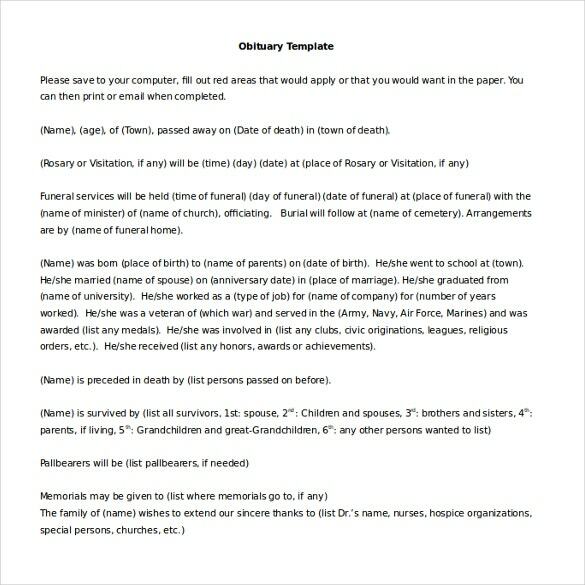 You can use our obituary templates for news paper. At least this will make the process less daunting. 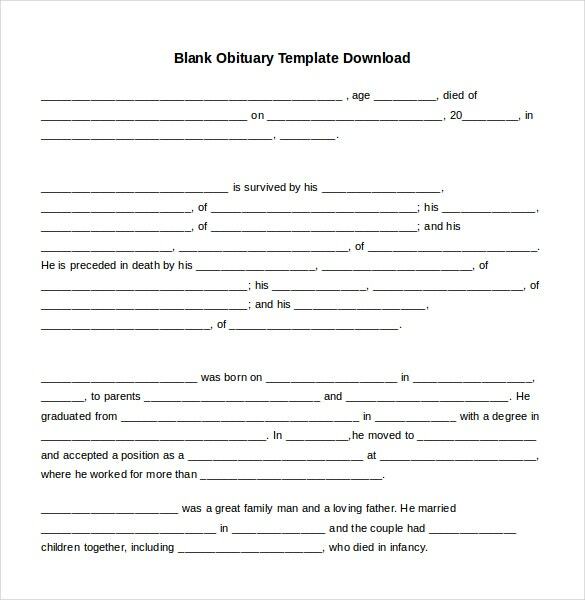 You can see also blank obituary templates. You can have your desired template ready in your system in a fraction of seconds. 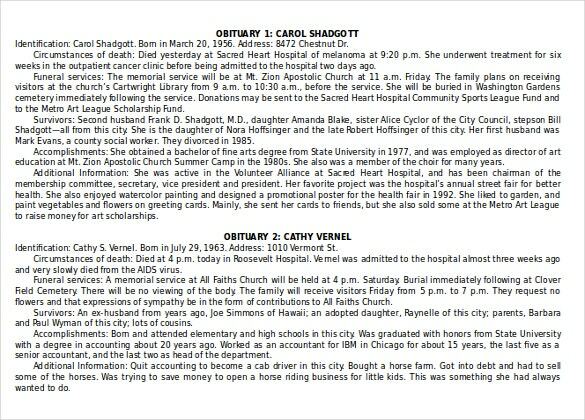 If you are yearning to write an obituary on your own, the website even has suggestions and ideas including word files of obituary samples. 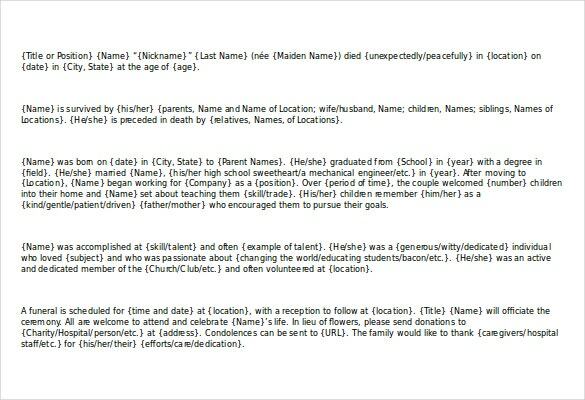 They are the standard obituary examples and obituary formats. 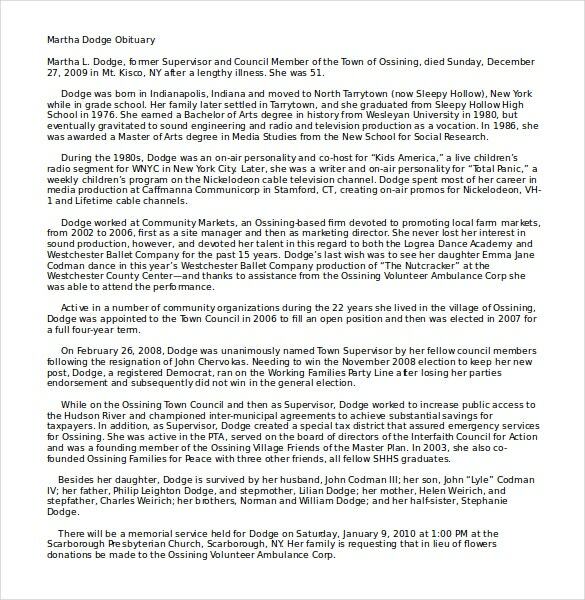 Dateline – The obituary generally starts with the “dateline” – a simple heading that lies atop of the page. 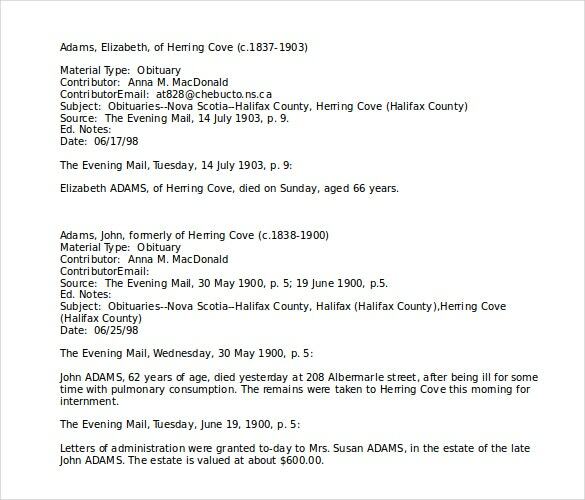 Details of the deceased (name, age, residence, and place of birth). The names of the survivors such as parents, spouse, children, and other family members generally listed thereafter along with the quality times happy and relishing moments to cherish. This area can be accompanied with the timeline of his/her happy hours and quality times he/she spent throughout the ages such as happy teens and the nuptial. The last section generally talks the whereabouts of interment ceremony. This is the who, what, where, and when of the services. There also would be a post-funeral program held in the name of acknowledgment, where the family members of the deceased thank all the relatives best friends, and biblical authority for their kind support, words of the console and monetary donations. If there will not be any services or should the arrangements be incomplete, these items should still be addressed in the obituary. This is particularly true if no services are planned. By giving this information, it helps eliminate people calling and asking when the funeral will be. Sometimes this simple phone call will trigger a flood of emotions and lengthy explanations of why no services are planned can be avoided. 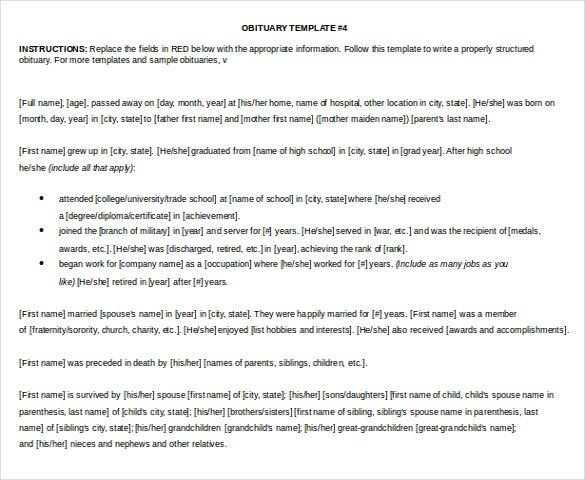 The sample obits are the templates in Word gives you a gist of obituary templates, delicate topics to consider, and pitfalls to avoid. Note: When it comes to content, we deliberately left few areas with XXXXX. You can see also psd obituary templates. This indicates that the data is user-defined and hence be filled by them. Flexible to use and reuse We provide the most compassionate services at the most affordable prices. Our word documents give you an option of use and reuse multiple times. We are sure that the first time users will excite about using it. Indeed, our flexibility is way beyond to reusability. The word documents are very comfy for translation. That means they allow the calendar to translate to their native language. The customization of our word documents is so flexible. You can insert images of your loving ones as background images and also play around with the colors and other themes such as inserting religious artworks, if the event is based on religious notes etc; Also if the expired one is having any favorite color, you can customize the template with the same radiant primarily. If you are not so dextrous at that, our customer support will help you in doing so, or we will do the modifications for you. We use commercial free fonts and CMYK (Cyan, Magenta, Yellow, and Black) colors. We will even insert photo collages. We keep the word 2010 documents macro-free so that they will not raise any unnecessary surprises to your document. Also, one can use these for non-commercial use. These word files come with no expiry date. Hence, one can use them as and when they are needed. However, these are not for distribution or resale. All the content in our websites is copyright. All rights reserved. Data provided is subject to change without notice. No hidden fee guaranteed. If that is not enough, we are ready to reduce or reimburse the charges. We are the only ones to offer this in the current market. The fact that word evolves over the generations and the recent versions of it such as Microsoft word 2010 and 2013 are as stable as FrameMaker and other XML-based tools. If you feel the template need some changes in order to meet your requirements, you can always customize them. Not only that. We are open and welcome the feedback, if you feel there is a room for improvement, please post us. The calendar has everything you need and you wish to have. My clientele is happy with the docs and looking forward to using them. Our previous templates on word have been signed up by more than 5000 people. If these are not enough, one can even get a prepaid funeral (No! You are not overheard). Yes, nowadays people, who are so healthy and are expecting the longevity are planning their obits beforehand as they don’t want their kids to go through so much of falderal. Leg a tour to our website and have a look at our previous obituary bi-folds, trifolds, and flyers appertained thereunto.